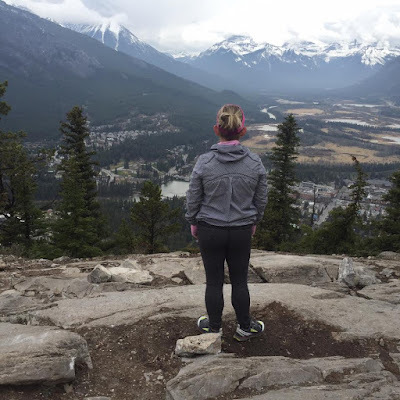 On Saturday we were heading out for Canmore for Charlotte's second birthday so we thought we would finish off the day with a hike in Banff before heading back to Calgary. 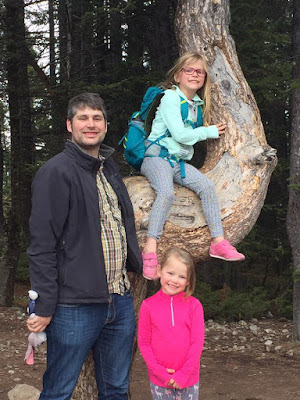 We let Finley pick and she picked Tunnel Mountain because it is easy and you get to climb a mountain which is a very big deal for a 7 year old even if we have climbed this mountain at least once every year since she was in my belly. Finley got a hiking back pack for when we do bird lake in August and she loves to use it every time we head out. 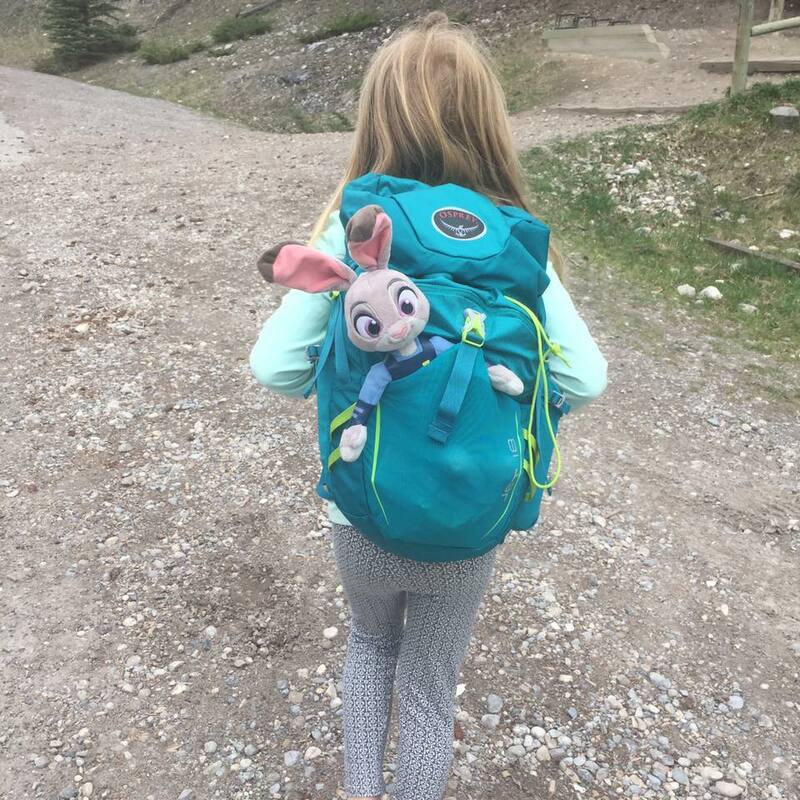 She is very insistent that nobody else brings a backpack and that she carries everything. There wasn't much in her backpack today - just a couple of water bottles, fruit snacks for her + Penelope and their rain coats. Officer Judy Hopps also had to come along. It was her first ever hike and she was apparently very excited. Tunnel Mountain is a great hike for young and old . 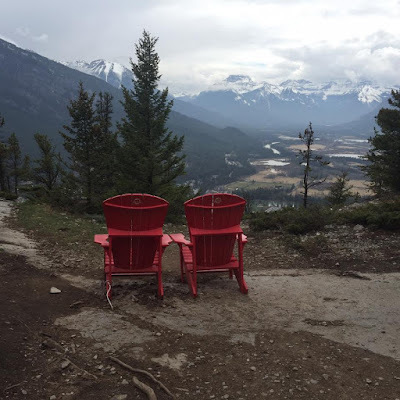 While there are a few steep sections, it is generally a very easy hike up to the top of a mountain with plenty of beautiful views along the way. Both kids hiked this by foot before their 2nd birthdays so you know it's not that difficult. This photo is overlooking the backside of the mountain into a golf course. I think it's Banff Springs Golf Course but I am not 100% sure since I am not a golfer. If you go without kids or your kids are older, you can be up and down in under an hour. If you have kids it might be longer, especially since they like to sit at the top and have a snack and watch the world below them. "You don't climb a mountain so the world can see you. You climb a mountain so you can see the world". No idea who said this but it is one of my favourite quotes and it comes to me each and every time I climb a mountain - big or small. A mountain is still a mountain no matter how high. There is something so serene about getting to the top and just watching. And you can tell that most people up there feel the same way because it is so quiet. We were very excited to see the red chairs near the top of Tunnel Mountain. And seriously what a view to sit down and look at. It doesn't get much better then this. 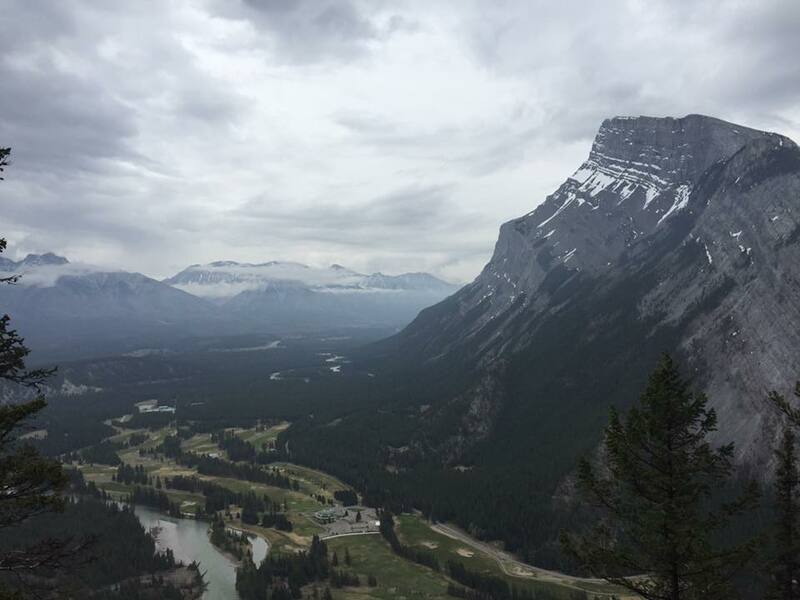 And the best part is that right now Banff is in between seasons for tourism so while it is still a little busy along Banff Ave, this hike was relatively empty on Saturday. Some days it can be crazy busy which is why we tend to do it before the summer tourism rush. Don't let Finley's smile fool you here, she was completely terrified. She eased up because Greg was there but in the photos of her on the tree branch all you see is pure fear on her face. Penelope had the same smile as this photo of all the ones of her sitting on the tree branch. After our hike up and down Tunnel Mountain, we strolled along Banff Ave before stopping for supper at Park Distillery. If you have never been, we highly recommend it. 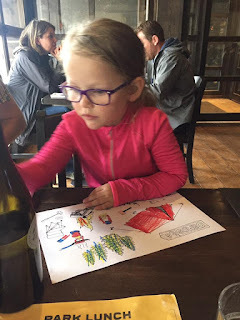 It is by far one of our favourite restaurants in Banff. Greg ordered the special and I have no idea what it was called but I am disappointed even as I type this that I didn't order it too. It was perfectly seasoned shrimp and deliciously flavoured steak that was so incredible tender and a bunch of other stuff. Lucky for me, he let me try some of it. They have a great kids menu too in case you are wondering. Finley had pulled pork tenders dipped in a maple mustard sauce which tasted like pancake syrup and Penelope had a grilled cheese sandwich. 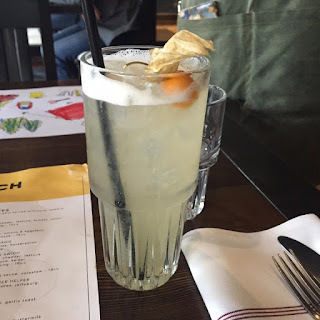 I had the most amazing beverage called the Aemmer Couloir which was Dry gin, elderflower liqueur, apple juice, mango jam, lemon juice, and sugar syrup. It was heavenly. Not too sweet (which is what I typically like) but not too bitter either.